First thing’s first, think about how you use your space. If you spend time in your living room playing games with the family, you can opt for a warm, welcoming paint color. Or maybe your living room is the place where you unwind at the end of the day to watch a few episodes of your favorite soap opera — then darker walls would be ideal to keep reflection off of your TV screen. Do you entertain guests in your living room? Then exciting, vibrant colors can work to set the tone of the party. Consider how you spend your time in your living room, and pick a color or two that suit your activities and the mood that you want to experience. If you have a smaller living room, then you might want to use lighter tones throughout your space. Lighter colors help to make a space feel more airy and open, while darker colors may appear to shrink the space. Also, consider lighter colors if you have lots of furniture, since that furniture can “shrink” the space. Combine lighter colors with plantlife and mirrors to give your living room even more of a spacial boost. If you want your living room to feel intimate and cozy, then you can opt for dark tones to paint your walls. Darker colors may make a room feel smaller, as we mentioned, but that may prove appealing if you want to turn your living room into a comfortable den. Darker colors can also make your living room an ideal place to unwind and nap, quietly read a book, veg out, or watch a movie. Pair dark paint colors with darker furniture to complete that cozy feel. 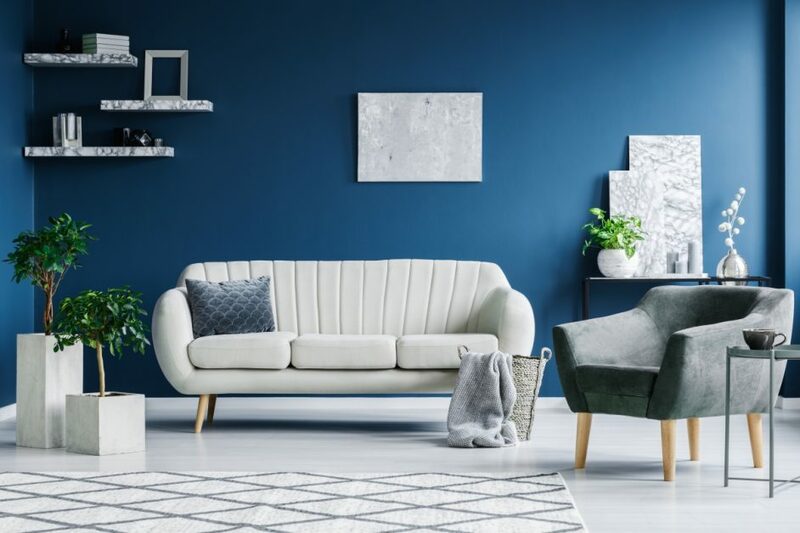 If you’re filling your living room with new furniture after you’ve painted it, you can consider how that furniture will look in this new setting. Ask yourself: Does the furniture fit the walls and floors of my living room? How about the lighting? Will it look out of place? You can save a paint swatch from your paint job as you peruse through items at a furniture store, to see if these furnishings will work well with your walls. If you’re matching your current furniture to your upcoming paint, then you can still compare the paint swatch and your furnishings side by side. Regardless of your situation, you can always go with furniture that is close in color to your wall colors. However, you don’t want to have furniture that is exactly the same hue as your walls, since it can overwhelm the space. Instead, opt for furniture that compliments your wall colors or furniture that is a few tones or hues away from the colors of your walls. Paint Your Living Room Today! Ready to get started? Or still undecided? Well we can help. We can consult with you to help you settle on a color for your upcoming painting project. Or if you’ve settled on the perfect color for your living room, we can schedule your paint job — give us a call either way!